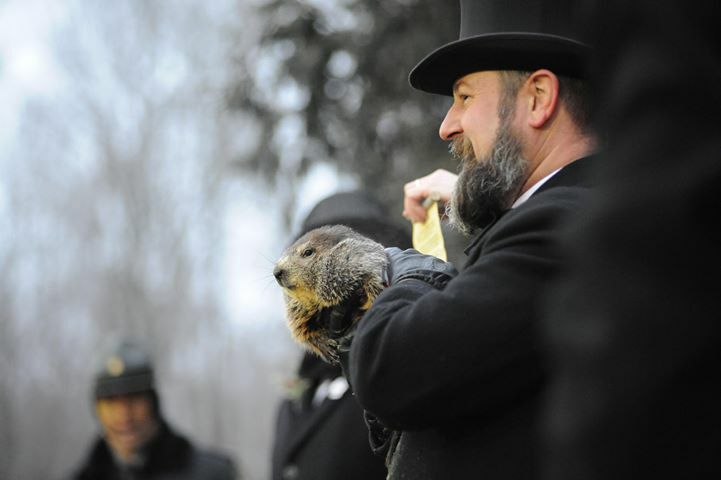 GOBBLER’S KNOB – For the past 133 years, Punxsutawney’s famous, weather-forecasting groundhog, Phil, has been fetched from his burrow mid-winter Feb. 2 by members of the Inner Circle and raised overhead his thousands of worldwide followers who rely upon his prediction. As the legend goes, if Phil wakes from his winter sleep and sees his shadow, he warns of six more weeks of bad weather and scampers back into his burrow. If Phil wakes and finds himself shadowless, he takes it as a sign of an early spring and stays above ground. According to members of the Groundhog Club, Phil, after making the prediction, chatters to the club’s president in “Groundhogese.” “Groundhogese” is a language, which only the current club president can understand, and his forecast is then translated for the entire world. At sunrise at 7:27 a.m. this Groundhog Day, Phil emerged from his temporary burrow surrounded by members of the Inner Circle in top hats and tuxedos and to the cheers from his thousands of faithful followers. In Groundhogese he directed the Inner Circle president to his prognostication scroll. It reads “Down in my burrow on long winter nights, I listen to tunes to keep my mind right. “… Your cheers at The Knob really give me a thrill and everyone singing to the world ‘Phil, Phil, Phil’ but predicting the weather, that’s my song. Punxsutawney held its first Groundhog Day in the 1800’s. The first official trek to Gobbler’s Knob was made Feb. 2, 1887. So, the legend goes, Punxsutawney Phil was named after King Phillip. Prior to being called Phil, he was called Br’er Groundhog.